St Nicholas of MyraOur father among the saints Nicholas of Myra, Wonder-worker, was the archbishop of Myra in southern Asia Minor in the fourth century and is also the basis for the Santa Claus legends and imagery which accompany Christmas celebrations in much of the world. By tradition, Nicholas born in the province of Lycia in the southern part of Asia Minor in the city of Patara to well-to-do parents. The date of his birth is not known. Having inherited his parents' estate, he became known for his generous gifts to those in need. As a youth, he made pilgrimages to Palestine and Egypt. He was subsequently consecrated Archbishop of Myra as the fourth century began. He was imprisoned during the persecutions of Diocletian and released by Constantine after his ascension to emperor. Nicholas was noted for his defense of Orthodoxy against the Arians. He is reputed to have been present at the Council of Nicea, but his name does not appear among any documents from that era. He died in Myra on December 6(19)in a year uncertain, but between 342 and 352. St Nicholas the WonderworkerMany of the details of his life that we have appeared during medieval times. St. Methodius, Patriarch of Constantinople, in the middle of the ninth century produced a life of Nicholas in which he noted that the life of Nicholas was unknown to most of the Christians of the time, thus indicating his composition was probably based mainly on legend. Methodius noted that Nicholas was raised well by pious and well-to-do parents and related how Nicholas contributed from his inheritance the dowry for three daughters of a citizen of Patara who had lost all his money. His feast was being celebrated by the time of St. Justinian two centuries after his death. After Methodius' life of Nicholas became available, Nicholas was acclaimed and honored throughout Europe and especially in Italy. When Myra was captured by the Saracens in 1034, many Italian cities planned to "rescue" his relics. In 1087, forces from Bari, Italy, attacked Myra and carried away his relics from the lawful Greek guardians in Myra to Bari where they were enshrined in a new church. His fame increased. The story of his rescue of sailors in the Aegean Sea during his lifetime established him as the patron of mariners. 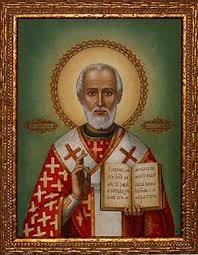 His popularity in Russia rose to the point that almost all churches had some sort of shrinehonoring St. Nicholas. In time his fame in northern Europe as a saintly bishop began changing to that of a giver of gifts to children, usually done on December 6. As immigrants from the Germanic and Nordic lands settled in the United States the image of St. Nicholas, or "Sinterklaas," as he is known among the Dutch, slowly changed to that of "Santa Claus" with little tie to the spirituality of Christianity. And saving the innocent from death. Therefore you are blessed as one become wise in the grace of God.